Click the help button to access the map legend, plan your trip, and find instructions on how to use the map. The Schuylkill River Greenways map is divided by Trailheads, Trail Towns and Places to Visit. Click on the category of your choice and a dropdown list of content will appear. Click any of the options within the dropdown menu and additional content will appear. Or, click on the “Places to Visit” category to see all available activities along the trail. Another way to navigate the map is to rollover the icons on the map. The preview will show you what kind of item it is. Click on it to reveal more information. Use the quick links at the top left to filter through Trailheads, Towns, and Places to Visit. 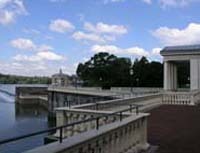 The Fairmount Waterworks is located on Waterworks Drive off of Kelly Drive in Philadelphia's East Fairmount Park. Parking is available behind the Philadelphia Museum of Art and along Waterworks Drive. 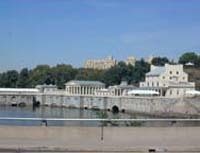 The Fairmount Water Works was constructed in 1812 to pump water out of the Schuylkill River to serve the bustling City of Philadelphia. As Philadelphia rose into an industrial powerhouse, it was the first large American city to regard the delivery of safe water as a municipal responsibility. Powered by the river, pumps raised water into reservoirs high atop a nearby hill, Faire Mount. Almost from the day the waterwheels began turning, the graceful neoclassical buildings and beautiful grounds made the place an international tourist attraction renowned for melding nature and technology. Today the Water Works is an Interpretive Center that offers visitors information about the impact of water on their daily lives, and how they in turn impact their water supplies. The Interpretive Center features a variety of hands on, highly interactive exhibits including a live view of the the Fairmount Dam fish ladder and a flyover of the Schuylkill River watershed.